PRICE: 1500 yen at Hobby Link Japan. The Vought F-8 Crusader (originally F8U) was a single-engine aircraft carrier-based air superiority fighter aircraft built by Vought for the United States Navy and the U.S. Marine Corps, replacing the Vought F7U Cutlass. The first F-8 prototype was ready for flight in February 1955, and was the last American fighter with guns as the primary weapon, principally serving in the Vietnam War. The RF-8 Crusader was a photo-reconnaissance development and operated longer in U.S. service than any of the fighter versions. RF-8s played a crucial role in the Cuban Missile Crisis, providing essential low-level photographs impossible to acquire by other means. US Naval Reserve units continued to operate the RF-8 until 1987. To 1/144 fans, Platz needs no introduction. They are one of two companies that produce high quality 1/144 injection molded combat aircraft. Fortunately, there is no overlapping with Platz doing more jet types than the other guys. 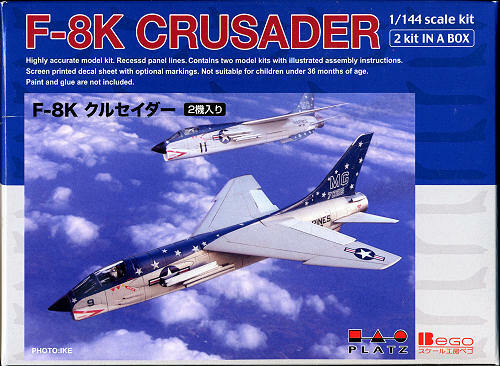 One kit that sold out about as fast as one heard about it was their earlier F-8C Crusader. Well now we have it in the F-8K version that is pretty much the same plastic. Typical of Platz, you get two full kits and a superb sheet that, in this case, will do three different planes. As one would expect, the engraved plastic is very detailed for this scale and totally free of any mold glitches. The cockpit consists of a fairly nice bang seat, generic control stick, and an instrument panel. The two piece wing is well done and can be displayed with the front of it raised. Landing gear and properly done with the gear doors in some cases molded onto parts so this is pretty much a gear down model unless you want to do some cutting. A clear, one-piece canopy tops the cockpit and there are options for a pair of Sidewinders and or a pair of Zuni missile pods. The mounting looks like the usual 'Y' mount one often sees. A set of smaller horizontal stabs are supplied as they are more appropriate to the earlier Crusaders. 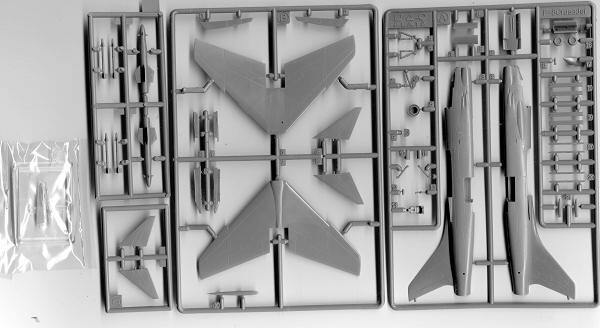 I should also mention that the nose for this kit is only early Crusader so those thinking they'll use this kit for an F-8E or F-8J will have to think again or be willing to use the wrong nose for it. Instructions are well done, but seem to be somewhat generic. By this, I mean that they show bits and pieces that may not be applicable to your model. As an example, you are provided with the lower ventral strakes and the afterburner cooling scoops as well as the 'Y' shaped missile pylon. Yet not all the options use these items. It is up to the builder to closely investigate the markings options to see what is used on what. Markings for this kit are the box art plane from VMFA-321 in 1972, an F-8A from VF-142 in 1959 (this plane will have no ventral strakes, no cooling scoops and will not have the 'Y' missile rails), and an F-8C used by NASA in Fly by Wire testing. The NASA plane later had a camera pod attached to the front of the fin. Neither the F-8A nor the NASA F-8C have the ESM pod on the aft fin. Decals are superbly printed and are as good as any quality aftermarket set. Considering how quickly the previous Crusader sold out, if you have any desire to get this kit, you need to do so soon. Thanks to Hobby Link Japan for the preview kit. Get yours here.